George E. Bushnell was born on November 4, 1887, in Roanoke, Virginia, of Scottish descent. His work with the law was not his initial career path. He attended Virginia Polytechnic Institute and graduated in 1907 with a degree in engineering. Following his college experiences, he worked in the advertising firm of Sperry and Hutchinson in New York. He served as a Lieutenant in the Motor Transport Corps in World War I. In addition to public service, he worked with the law firm of Sempliner, Dewey, Stanton and Bushnell. 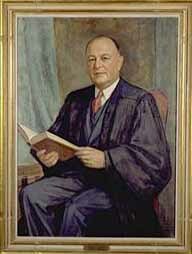 He was elected to the Michigan Supreme Court in 1934 and served until 1955.